Filmfood: "Julie Andrews Cockroach Salad"
Julie Andrews starring as a pennyless singer in 1930's Paris. She becomes the toast of the Night Club world by pretending that she's a man impersonating a woman. This brings her success in her professional life but complicates her personal life. Robert Preston plays her flamboyantly Gay friend and James Garner is all confused because he is falling in love with what everyone thinks is a man. Scene: Victoria is trying to get a free meal by letting loose a cockroach in her salad. Insects are beneficial to us not just ecology-wise, but also health-wise. Marcel Dicke makes an appetizing case for adding insects to everyone's diet in his TEDX Talk. His message to squeamish chefs and foodies: delicacies like locusts and caterpillars compete with meat in flavor, nutrition and eco-friendliness. 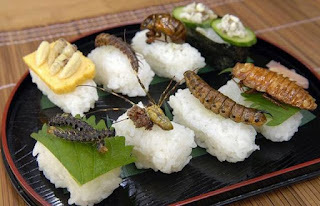 Japanese chef Shoichi Uchiyama has specialized in insect cuisine. His blog is in Japanes, but there are many photos of great dishes made with insects. He's the author of the recipe book "Tanoshii Konchu Ryori" ("Enjoyable Bug-eating Recipes"), featuring 80 bug-eating recipes in Japanese, Western and other ethnic styles, as well as bug-based desserts. How to make his amazing Insect Sushi?